Davos, Switzerland is known for its luxurious mountains and equally luxurious ski resorts. While the municipality is home to numerous sweeping five-star resorts, options for more authentic and intimate lodgings are a bit trickier to find. Thankfully, we’ve done the work for you and rounded up the coziest locally-run hotels in the area. Edelweiss Hotel is a small, family-run hotel known for its great service and high standards. The décor is cozily modern, contrasting heavy wood with clean lines and subdued colors. The rooms are clean and comfortable, while the staff is incredibly warm and helpful. Breakfast is included as part of your stay, a buffet of smorgasbord proportions including options like salmon, ham, and eggs on top of the standard bread and cereal breakfast offered by most hotels. Watch out for: Room 007, the largest room in the hotel: essentially a penthouse with its own kitchen and a majestic mountain view. The three Klosters locals who run Hotel Wynegg have earned a reputation of going the extra mile to accommodate their guests, so you can be sure they’ll do whatever it takes to make your visit comfortable. The hotel itself is ideally situated in Klosters, conveniently close to ski lifts and rentals, and has a sweet chalet atmosphere perfectly suited to a picturesque holiday the Swiss Alps. The rooms are clean and well-kept, and the breakfast options are plentiful. This calm cottage also enjoys a close proximity to several popular restaurants in town, so it’s a great place to stay if you want to relax during the day and hit the town for some excitement after dark. 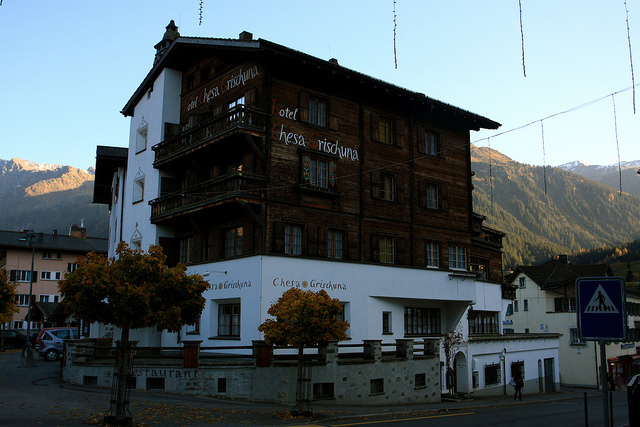 Hotel Chesa Grischuna embodies the epitome of Swiss charm, from its rich wooden walls to its charming dollhouse-like furnishings – such as the sweet decorative carvings on the bed frames, which are tidily topped with fresh linens and blue-and-white striped blankets. Between the immaculately kept rooms and mouth-watering meals on site, you can truly put your feet up and forget your cares at this family-run hotel, with the help of the friendly and efficient staff. If you start to get cabin fever, Chesa Grischuna is also located in the heart of Klosters, so there’s plenty to explore within walking distance. Watch out for: the warm staff and the charming surroundings. Away from Davos’ noisy center, Hotel Ducan is an absolute gem. With its traditional wood features, warm, spacious rooms, and kind, accommodating service, this hotel offers an iconic Swiss chalet experience. With its complimentary sauna and relaxation area for guests, this chalet is a wise choice for anyone seeking a tranquil retreat from the stress of everyday life. The hotel’s restaurant is also known as one of Davos’ best dining options, serving hearty slow cooked meals and ample breakfasts with out-of-this-world homemade jams. When you book your stay here, see if the room with the balcony view is available – it’s well worth it. Turmhotel Victoria is a quaint hotel with Old European styling straight out of a fairytale. Tucked away up in the mountains, this dreamy little place may be one of the last original Swiss chalets, though its interior has been significantly modernized to provide maximum comfort to its patrons. Their rooms are all crisp white walls and linens balanced by rustic wooden furniture and tasteful artwork. The hotel is excellently situated right by the railway station and the Parsenne slopes, and the friendly staff serves an extensive complimentary breakfast to energize you for a full day on the Alps.